Located to the east of Thailand, Trat province offers travelers a variety of attractions – from stunning blue seas, abundant forests and mountains, magical waterfalls, to community-based tourism. Strong practices in environmental awareness contribute to an endless list of activities. Koh Chang, Thailand’s second largest island after Phuket as a popular getaway boasts powdery white sandy beaches, a plethora of boutique resorts and restaurants to chill out. 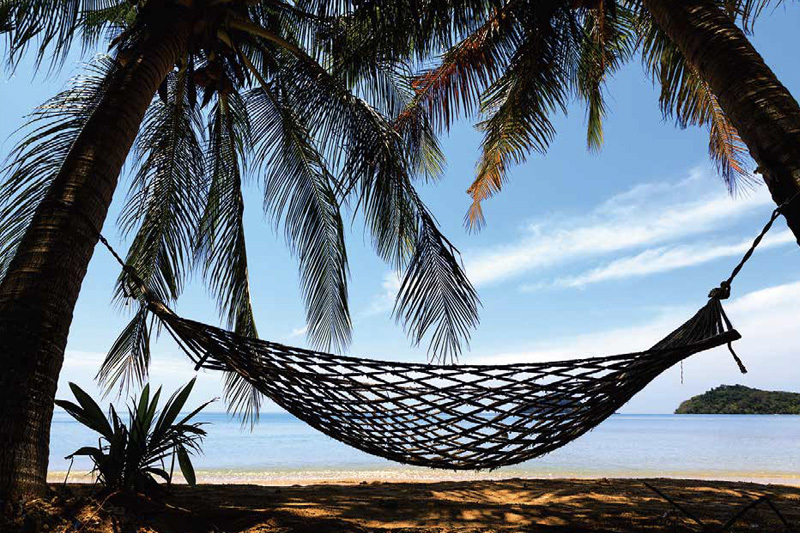 With abundant ecosystems, Koh Chang makes for a year-round paradise for all sea and beach lovers. For a different island vibe, there’s charming Koh Kood, also surrounded by the azure sea and blessed by bright blue skies that’s a haven from a busy city life. Enjoy the luxury of time while strolling around the fisherman village in Ao Salat (Pirate Bay) and embrace the slow-paced lifestyle. Dotted with seafood restaurants, Ao Salat is a place to get the fresh catch of the day from the sea, both cooked and raw. Enjoy a variety of beach activities or laze around in the resort on the island. Koh Mak island sits between Koh Chang and Koh Kood. This idyllic island offers an enticing line of coconut trees along the powdery white sand beach that will put you in vacation mode. With crystal-clear water in the bays being calm and safe, visitors can choose to dive into Ao Ta Nid, Ao Phai, Ao Prong, Ao Pad and Ao Daeng. The villagers live a simple life, engaging in their work in rubber plantations and traditional fisheries. The abundant coral reefs around Koh Mak and its neighbouring islands make popular spots for shallow water snorkeling. 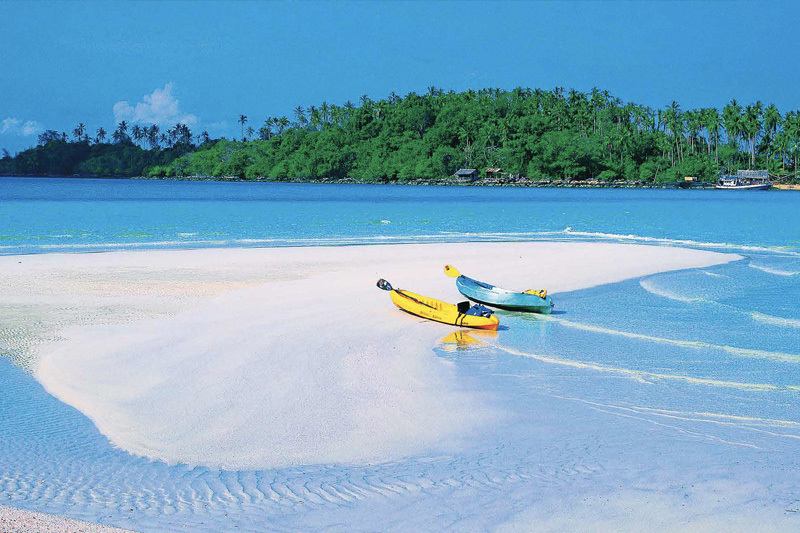 Close to Koh Mak is Koh Kham, an island where a huge volcanic rock lines the shore, making a dramatic contrast against white sand and deep blue sea. The vibrant coral reef on the east side of the island is a beautiful place to snorkel and scuba dive. Apart from the beautiful islands and stunning sea, Trat also has various interesting community-based tourism attractions under its sleeve such as Ban Nam Chiao Ecotourism Group, and Huay Raeng Sub-district Ecotourism Group. These community-based tourism initiatives are outstanding places to learn how to live harmoniously with different cultures and beliefs and with nature. 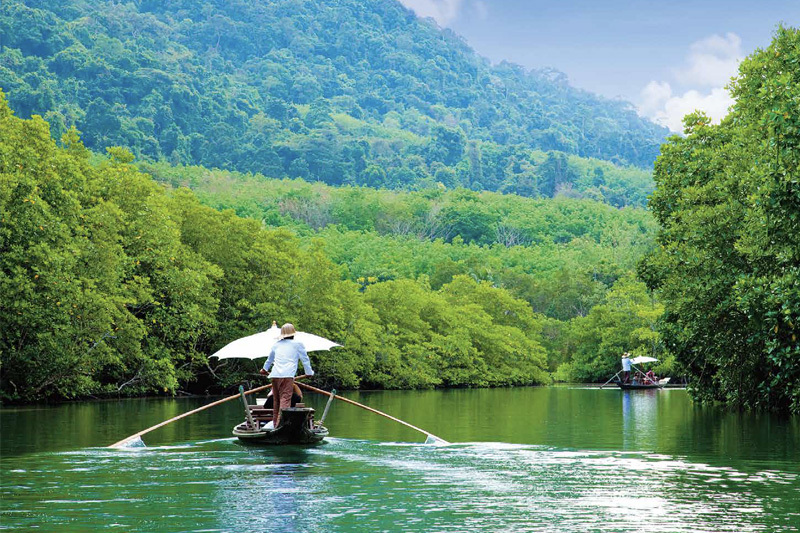 Ban Nam Chiao Ecotourism Group is a multicultural community where Buddhists, Muslims and Thai-Chinese groups live happily together with everyone respecting the different cultures and religious beliefs. Ban Nam Chiao community is proud of its famous handicraft “Ngob Nam Chiao”, traditional woven hats made from palm leaves and bamboo in the shape of a wok pan. Blessed with an abundant ecosystem, the Huay Raeng community dwells in the heart of major diversity with sources of fresh water, brackish water and brine. The seasonal tides give the shoreside plantations plenty of nourishment, making it fruitful all year round. The community is also well-known for its folk wisdom learning and sharing. By relying on their knowledge, the strong-bonded community live harmoniously with nature. Villagers grow vegetables and fruits, catch giant freshwater prawn, make rice wrapped in betel nut bract as an eco-friendly lunchbox instead of using plastic containers or plastic bags while artisan soap is made from mangosteen rind. For more information, contact Tourism Authority of Thailand (TAT) Trat office at +66 (0) 39 597 259-60 or the Visitor Information Centre 1672.